Samsung Galaxy S4 Won’t Turn On? Do This Right Now! Once upon a time, a friend of mine bought the Samsung Galaxy S4. She so much fell in love with her new phone and would never for a second take her eyes off it or let it be. One day, she discovered that her Samsung S4 won’t turn on and it felt like the World had ended. .... Sure, I'll let you know what happened but before, that let's get your phone to boot up. - Samsung galaxy s4 won't turn on black screen. Samsung is one of the most popular Smartphone brands in the world, with millions of orders each time a new flagship is released, Samsung has arguably stolen the hearts of consumers and become the best brand all over the market. 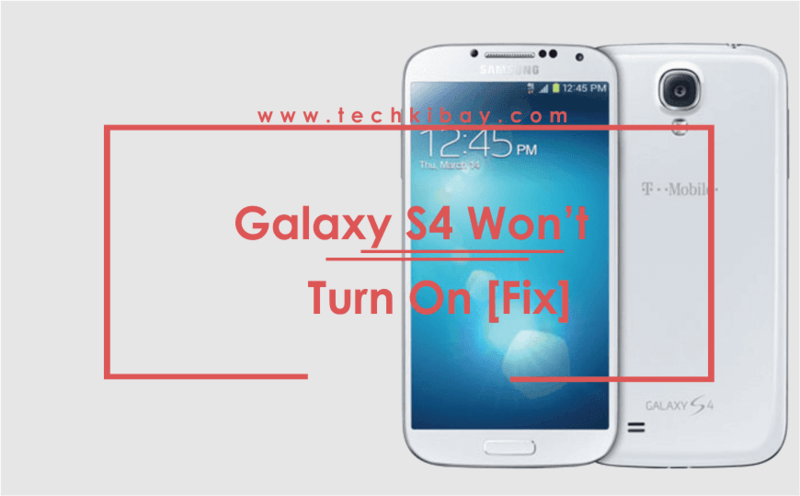 While there are many reasons why your Samsung Galaxy S4 won’t turn on, its best you try out a couple troubleshooting to come at a final conclusion on what the problem is. When your Samsung Galaxy S4 won’t turn on even after holding the power button, the first step to fixing this to perform a soft reset. To perform a soft reset, just take off the back cover of your Galaxy S4 and remove the battery. Now press and hold the power button in order to drain off the little electric current that is stored in the internal component. Do that for about a minute and then put the battery back in and try to turn on your Galaxy S4. This particular step is a very effective troubleshooting method. Whenever your phone turns off and refuses to turn on for no just reason, try this. You shouldn’t worry about your files, apps, contacts and data because nothing will happen to them. Now if your Samsung Galaxy S4 won’t turn on or respond after performing the soft reset, then there could be chances that your battery is drained out and there is no juice left to boot up your phone. What you should do in this case is to plug in the charger to the socket and the connector to the phone. I’ll advise you charge your Galaxy S4 with an original Samsung charger, but in the case you don’t have one, make use of a good charger. If charging, the phone should show the normal charging icon or the LED notification light but if not, just leave the charger plugged in for at least 10 to 15 minutes. You could set an Alarm for that. Once it’s more than ten minutes of charging, place your hand at the back of the phone to check if the phone is hot. If you notice any sign of heating, it could be sign of a battery or USB charging port problem. To fix this, you should consider taking the phone to a technician. You probably know that booting a device in safe mode temporary disable all third-party apps installed (though that’s not our aim). If your Galaxy S4 won’t turn on, you should check if it perfectly boots up in “other” modes. This will eliminate the possibility that it is a hardware or battery issue. Step 2: If the phone responds to the power button, you should see the Samsung Galaxy S4 logo appear on the screen. Once you see the logo, you can let go of the power button. Step 4: Now continue holding the volume down button until the phone reboot process is complete. Step 5: This is the final step, once you see ‘Safe Mode’ displaying at the bottom left corner of the screen, release the volume down button. But if nothing comes up, retry the process until you get the phone to boot up in the safe mode. Now if you have done all these and still, your Samsung Galaxy S4 won’t turn on, then you may want to try out the next fix. The recovery mode is another bootup mode you should try when the Galaxy S4 won’t turn on. If you can successfully boot up the recovery mode, there are two things you can do to get your phone up and running. You could either perform a full factory reset on the Galaxy S4 or just clear the cache partition (this will only delete data inside the cache folder). How to perform both of them are explained below. iii. When the phone vibrates, let go of the Power button only. iii. While you continue holding the Volume Up and Home button, the Android System Recovery screen should appear. Once it appears, you can then release both the Home and Volume up buttons. iv. With the help of the Volume Down button, highlight ‘ wipe data/factory reset’. Now press the Power button to select the option. After the reset process is complete, select ‘Reboot system now’ and press the power button to restart your phone. ii. When the phone vibrates, let go of the Power button only. iv. With the help of the Volume Down button, highlight ‘wipe cache partition’. Now press the Power button to select the option. While you should know that you can only complete the guide if your phone successfully boots up in recovery mode. If you do it correctly, the phone will automatically restart. However, if you’ve tried out all procedures explained in this guide and still, your Samsung Galaxy S4 won’t turn on or go into recovery, then more likely your S4 may have developed a hardware problem. This should be your last resort. Allow a technician to check your phone in order to know why your Samsung Galaxy S4 won’t turn on. The technician will try to boot up your phone with an alternative battery so as to determine the course of the problem and definitely get your phone fixed. ... While I won’t be able to tell you more about my friend, you should know that she no longer have to worry about Samsung Galaxy S4 won’t turn on issue and is now living in her own happily ever after story. Where you able to put on your Galaxy S4, which of these methods worked for you? Share with us in the comment section below.